These sturdy Hann tables are ideal for drawing and drafting. Each table features a 3/4” thick Fiberesin top that provides a rock hard, flat, smooth surface. A pencil ledge is standard. These tables are constructed of solid maple and hardwood panels and have a natural finish. The full width top measures 36"W x 24"D and is permanently fixed at a seven degree angle. Available options include a six drawer storage unit and a drawing board storage cabinet. Overall height is 39" at the front. Table with 6 drawer storage cabinet. Table with drawing board storage cabinet. 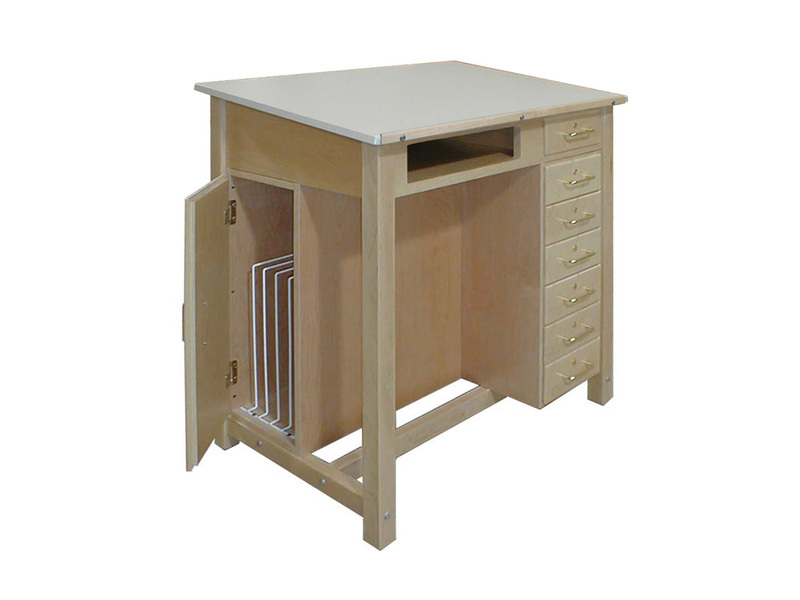 Table with 6 drawer storage cabinet and drawing board storage cabinet.